Industry giant, People’s Leasing and Finance Plc is foraying into Bangladesh to tap high growth prospects in the booming South Asian country with a near 200-million population. PLC will acquire 51% of the ordinary shares of the Bangladesh entity for Rs. 1 billion. The Company is yet again on the lookout for foreign financing facilities and aims to secure a syndicated loan in the range of $ 50 to $ 75 million soon. On the sidelines of the bell ringing ceremony for June at the Colombo Stock Exchange (CSE) to celebrate PLC’s 20 anniversary PLC, CEO D. P Kumarage told the Daily FT yesterday that the company would continually be vigilant on foreign markets and loan prospects looked positive thus far. The $ 50 million financing from the Emirates MND Bank was the second foreign facility that PLC successfully secured in 2014. First was a $ 10 million one-year facility which was also entirely financed by Emirates MND Bank. Both exercises were pursued following the support extended by the incumbent Government’s 2013 Budget. PLC’s CEO also said that the company would most probably go for a merger with People’s Merchant Finance (PMF) rather than acquiring 100% of the latter’s shares. Currently People’s Bank and PLC hold 87% of the company while PLC was appointed as the managing agent of PMF in May 2015. 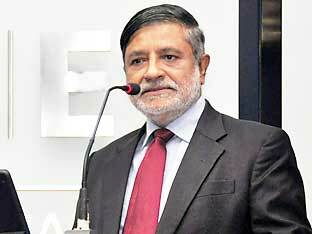 Noting that he expected PLC’s credit portfolio to grow by 10% this year, Kumarage said PLC was cautious regarding the continuous fluctuation in vehicle import tax rates and volatile interest rates; however he was confident that new infrastructure projects kicking off in the country could reduce the adverse impact.